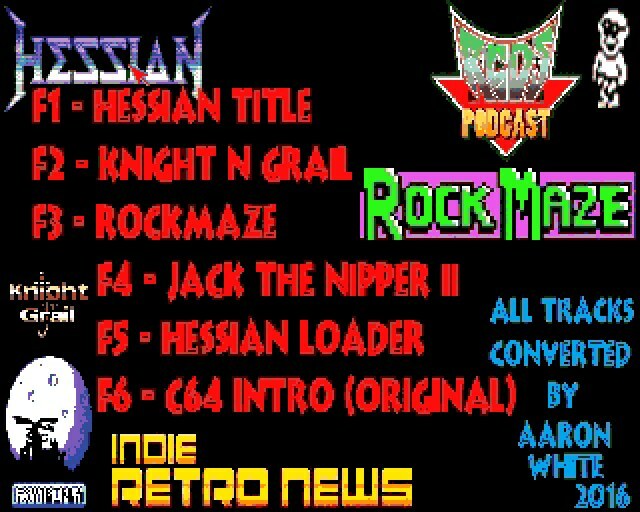 Indie Retro News: RGDS Podcast & Indie Retro News Presents - C64 Covers & Inspiration for the Amiga! RGDS Podcast & Indie Retro News Presents - C64 Covers & Inspiration for the Amiga! While I try my best to get over this ghastly flu, I thought I'd give a quick shout out for Aaron Whites new Amiga album release 'RGDS Podcast & Indie Retro News Presents - C64 Covers & Inspiration'. Now as you may have already heard but just recently Covert Bitops released a truly awesome C64 game called ' Hessian '. It is an action adventure game with a high attention to detail, with lots of enemies, rooms and much more. Well Aaron White has taken the soundtrack from that C64 game including the loader, and given them that sweet Amiga remix treatment. Oh and he's also done Knight N Grail, Rockmaze, Jack The Nipper II and his very own original C64 tune! What a great album indeed, and if it wasn't for this illness I'd certainly turn it up very loud!